DIY 8 inch Qee Series - come in Brand New Color Box with extra Bonus of paints. DOMO-Ku Qee series come in Blind Box in 2 inch style, The 2.5" figures will be feature the likeness of Domo, the iconic viral superstar who was first introduced to the world in 1998 by Japanese Broadcaster, NHK and is represented worldwide (except Asia) by Big Tent Ent. each individual figure contains a component of a special "Build-A-Domo" transparent figure. By assembling six of these components, a new variant figure is created by the consumer. Each counter display contains enough pieces for two of these; each master carton yields ten of this special item when all the pieces are assembled. Chase figures are being produced in addition to the common figures in the Domo assortment; with a total of 15 different versions with various levels of scarcity. Starting from a very unusual place as an advertising icon, Domo's unique look and personality has catapulted the character from 400 television spots in Japan into one of the Internet's biggest sensations, sparking worldwide recognition. As the poster child for personalized, user-generated content, Domo has been able to transition from popularity within Japan to a worldwide following, spawning countless fan-made images, websites and videos, along with a first-ever licensed product line including plush, toys, fashion and collectibles selling at major trend retailers nationwide. Most recently, Domo has taken America by storm, being featured prominently at major retailers all over the U.S. and even starring in his first worldwide manga. The Boxee Coin Bank - you can use the Head of DIY to 8 inch style! come in assorted color. here show you the nice set up of Booth we have! New York Toy Fair will be start today 2/15 (Sunday) - I will post photo of our Display daily. pls check it. but before the Show I have time to sight seeing in New York - The Wall Street! Tempicture is low at 3 Degree. Very Cold for me. 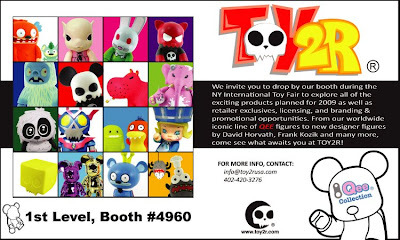 TOY2R extends an invitation for you to drop by our booth during this month's New York Toy Fair to see the exciting line-up of designer toys planned for 2009. We will be available to take you through all of our scheduled lines as well as retailer exclusives, licensing and branding & promotional opportunities. Onhand there will be previews of new figures coming out from David Horvath (co-creator of the UGLYDOLLS), Frank Kozik (one of the most prolific artists in the designer toy genre) as well as new creative items by up and coming artists. Prototypes of our licensed lines (SIMPONS, FUTURAMA and more) - several to be announced at the show! Sneak peeks at our licensed line of QEE releated products and so much more. 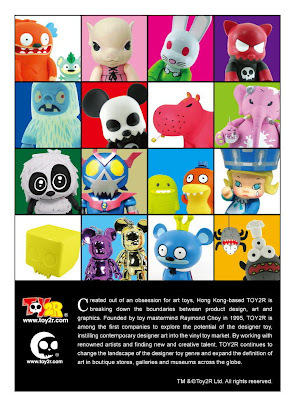 TOY2R extends its thanks to all of the artists who contributed to this project and made it a success. Toy2R demonstrated the art of designer toys and the D.I.Y movement for top government officals and premier business.We are very appreciated of our audiences and artists who gave us such a valuable opportunity to promote our concept of "Anyone Can Design". 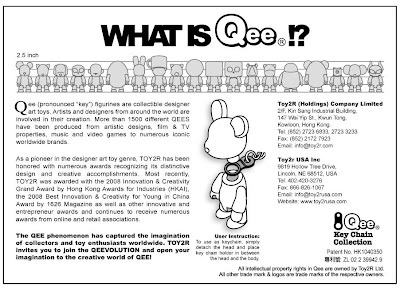 TOY2R is proud to present the STICKER QEE project. Created to display the innovation and support of the art of designer toys, TOY2R put together this 36" QEE BEAR during the award ceremony at the 2008 Hong Kong Award for Industries, one of the most influential commercial organizations in Asia. TOY2R was honored to receive the recognition as the Grand Winner in the category of Innovation and Creativity. This custom 36" QEE bear was created during the award ceremony, so TOY2R had to develop a way to quickly customize the figure in a short period of time. 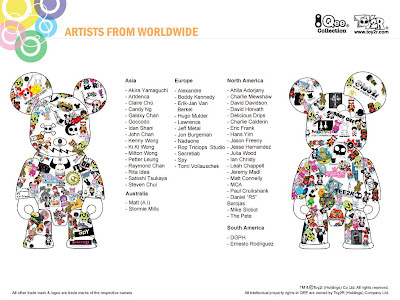 With the support of 66 artists worldwide - TOY2R secured art from contributing artists and created stickers to represent each one. The final result is seen an fine example of the collaborative efforts on a D.I.Y. project to bring worldwide attention to the genre. For those who missed our show, you also welcomed to visit our sticker qee's exhibition in Design Gallery. Bossy Bear books in Japan. Bossy Bear has his own blog in Japan! photo from the Blog, you can check it out here at this link.